I’m going to tell you a secret about oil companies. It’s far less expensive to drill a well than it is to “complete” it. A completion is the process of fracking the rock and plumbing the well to get out the oil. Oil companies must drill wells as part of their leases — the agreements that they make with the landowners. However, the low oil price means it isn’t profitable to produce oil from the wells. 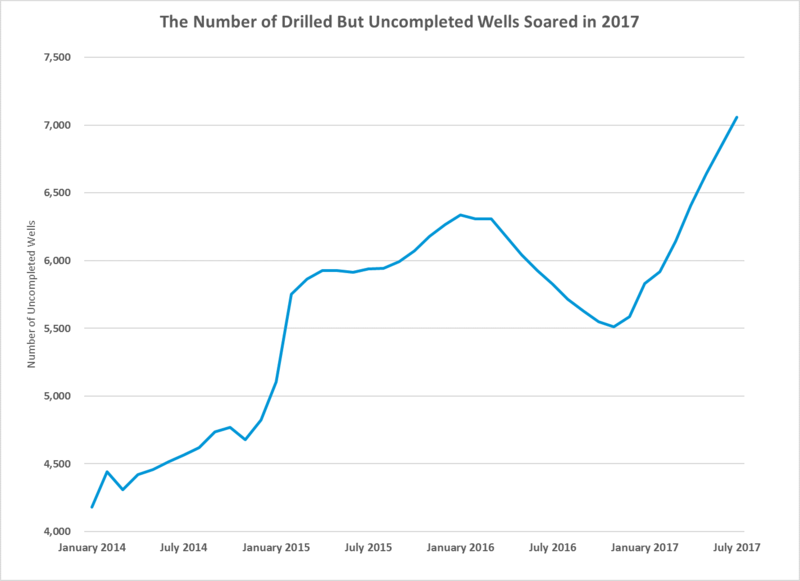 That’s where drilled but uncompleted wells (called DUCs) come in. Oil companies are honoring their work commitments by drilling wells. But they are not completing them. First, as I told you on August 18, the oil service industry is tanking. That’s in part because the oil companies don’t complete all the wells. The other problem is a huge backlog of oil wells waiting for higher prices. That means a higher price of oil will be met by a veritable flood of oil. We can expect volatile oil prices for at least the next year until this gets sorted out. « Previous Hide From Washington’s Thought Police … Now!